Sonic the Hedgehog is a platforming action video game. Developed by Sonic Team in 1991, the blue blur himself would become one of gaming’s universal icons, and became the first series to stand as a serious rival to Nintendo’s Mario series, flaming the legendary console wars. 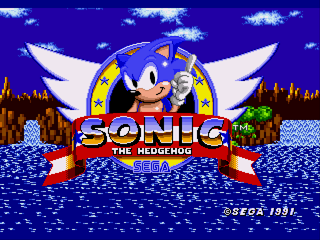 A classic 2-D side-scrolling platformer, you control Sonic, a blue-colored hedgehog that runs pretty darn fast across the stages (zones as they are called in the game). Scattered throughout the zones are golden rings that Sonic can collect, which allows him to not only take damage, but allow access to special stages. If completed, the special stage will grant Sonic one of six Chaos Emeralds. Dr. Ivo Robotnik, an evil genius, realizes the power of the Chaos Emeralds, and wants them for himself. As such, Robotnik traps the innocent woodland creatures of South Island. In response, Sonic attempts to free the creatures and collect the emeralds for himself in order to stop Robotnik’s plans.